Jones, David Martin/ Smith, M. L. R.
Synopsis: Academic and accepted orthodoxy maintains that Southeast Asia, and Asia generally, is evolving into a distinctive East Asian regional order. This book questions this claim and reveals instead uncertainty and incoherence at the heart of ASEAN, the region's foremost institution. The authors provide a systematic critique of ASEAN's evolution and institutional development, as well as a unified understanding of the international relations and political economy of ASEAN and the Asia-Pacific. It is the first study to provide a sceptical analysis of international relations orthodoxies regarding regionalization and institutionalism, and is based on wide-ranging and rigorous research. Students of international relations, the Asia-Pacific, Southeast Asia, regional studies, international history and security and defence studies will find this book of great interest, as will scholars, policy makers and economic forecasters with an interest in long-term Asia-Pacific trends. Jones, David Martin, Smith, M. L. R.
Jones, David Martin; Smith, M. L. R.
5. 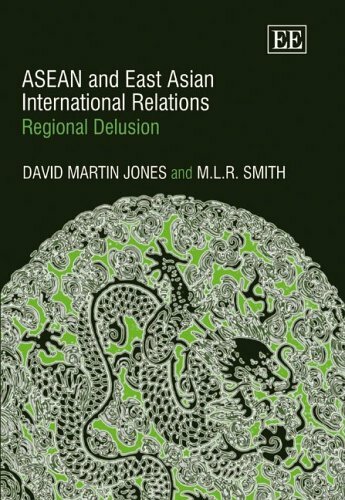 Asean And East Asian International Relations: Regional Delusion [Hardcover] Jones, David Martin and Smith, M. L. R.
6. Asean And East Asian International Relations: Regional Delusion [Hardcover] Jones, David Martin and Smith, M. L. R.